Rich, slightly acidic soil with excellent drainage. Full morning sun with partial afternoon shade. Cold hardiness varies with type. 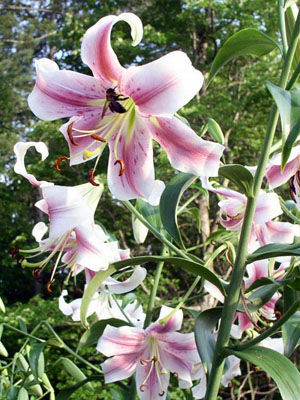 Asiatic hybrids tolerate temperatures to -35F (-37C), but taller Oriental lilies and hybrids are hardy to -25F (-32C). With excellent drainage, lilies can be grown in climates with harsh winters. Topdress with rich compost in late spring, after new growth appears. Fertilize with a liquid fertilizer in early summer, when plants are growing rapidly. When grown in good soil, lilies do not require much fertilizer. Dahlia, Hyacinth, Daylily and Echinacea. Tall Oriental lilies make regal plants for the back of a mixed border. Smaller Asiatic lilies grow to only 36in (90cm) tall and work well as feature plants that bloom in early summer. Use small mound-forming annuals like lobelia, portulaca, or sweet alyssum to hide the bare bases of lilies. Prepare wide planting holes dug to at least 12in (30cm) deep, and generously enrich the holes with rich compost and a balanced organic fertilizer. Plant lily bulbs deep, so that the tops of the bulbs are covered with 5in (12cm) of soil. When planting container-grown lilies, set them in prepared holes about 2in (5cm) deeper than they grew in their pots. Allow 12in (30cm) between Asiatic lilies but space tall Oriental lilies 8in (20cm) apart. Lilies bloom all at once, and because of their large blossoms they are often used as feature flowers. Tall Oriental hybrids are fragrant, and make long-lived cut flowers. Colors include white, red, orange, and many shades of pink and red. Cut lilies for arrangements when the buds are on the verge of opening, preferably in early morning. Immediately plunge the stems into cool water. As the flowers fade in the garden, snip them off with scissors or pruning shears. Invasive lily leaf beetles chew holes in lily leaves. They drop to the ground when disturbed, and can be collected by shaking them into broad pans of soapy water, or tarps spread over the ground. Use a spinosad-based biological insecticide to bring lily leaf beetle larvae under control.